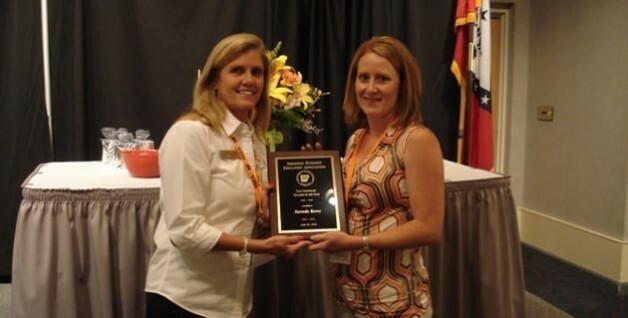 Darenda Kersey, business instructor at BRTC, was named the Arkansas Business Education Association (ABEA) Post-secondary Teacher of the Year at a conference held July 24-25 in Hot Springs. ABEA is a professional association comprised of business and marketing educators involved at the secondary and post-secondary levels. The purpose of ABEA is to promote quality education in all phases of business and to encourage professional growth and cooperative interaction among all individuals involved in this sector of education. Kersey was nominated for the award by one of her former business professors at Arkansas State University, Dr. Terry Roach, who is also the Executive Director of ABEA. When Kersey received word of her nomination, she was required to complete an information form and submit it along with five letters of recommendation. An awards committee evaluated all nominees and made the final selection. As an award winner at the state level, Kersey is automatically nominated for the Southern Region Post-Secondary Teacher of the Year Award. Winners will be announced at the SBEA conference to be held in April in Atlanta, GA.